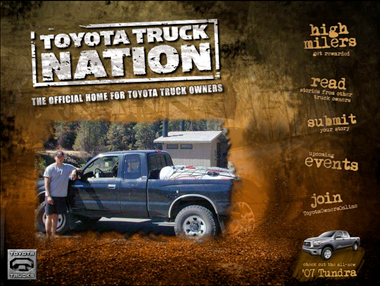 Many sites have changed over time, including the award-winning ToyotaTruckNation.com (W3, MarCom Platinum and Hermes Gold awards). including emails, newsletters, animated banners, and creating a system to manage these cyclical projects. At SaatchiLA, I was instrumental in developing a new position that provided a central point between creatives, product info, and the interactive department. I've also provided extensive writing and editing for Razorfish, Saab.com, JFShea.com, and others.